The Trolls and their new pals the Bergens learn that when it comes to holidays, it's not the decorations and presents that matter -- it's friendship. 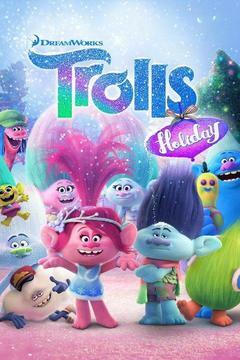 The Trolls sing about a holiday that's centered on slapping each other's faces (it's done in a silly, cartoonish manner). King Gristle is given a tattoo (seemingly against his will) that says "HUG LIFE" and also sustains some glitter-related injuries to his eyeballs. One of the holidays the Trolls sing about is a day when they celebrate "tear-away pants": Biggie is shown ripping his pants off while dancing, and his Troll nether regions (?) are blurred out -- a quick visual joke. There's talk of the holidays being more about togetherness than about "stuff" -- which is just a tad ironic, considering the huge line of Trolls-related toys and merchandise available. A character is briefly shown with a pipe -- and is roundly scolded for having it.